Chatbots offer organisations a chance to reach global consumers in an effective and cost-efficient way. Think chatbots are a cutting-edge concept? Well, think again. The world’s first chatbot, Eliza, was created all the way back in 1966 by Massachusetts Institute of Technology (MIT) professor Joseph Weizenbaum. Since then, millions of global employees have integrated these Artificial Intelligence (AI)-driven technologies into their everyday work routines. Even enterprise mobility efforts are beginning to adopt chatbots, since they’ve already helped companies all over the world increase organizational efficiency and customer satisfaction. By the end of 2020, 80% of businesses will implement chatbots to increase business revenue and improve overall engagement levels. Unlike a spam email or some other automated outreach method, however, chatbots deliver interactive and immediate responses to real-time questions. This means a ten-fold increase in the likelihood someone responds to one of these intelligent tech-driven conversations. A more personalized and efficient interaction platform can do wonders for a brand’s reputation. In fact, 72% of consumers say their lives have already been improved in a tangible way by messaging back and forth with an automated enterprise chatbot. So, how are today’s businesses using chatbots to streamline internal operations? Why are they choosing this technology instead of another option? And, how can a company ensure deployment success once it makes its own decision to adopt chatbots? While each company has its own motivations for implementing an automated chatbot, the world’s most successful solutions all have something in common: their primary motivation isn’t saving money or eliminating user support costs. Instead, these digitally mature strategies focus their AI-driven technology on tasks that dramatically improve each customer’s experience. Over the last year, customer support-oriented processes and workflows have been the preferred enterprise use case—by quite a large margin. In fact, 67% of today’s global workers admit they used chatbots to help customers and satisfy buyer requests at least one time in 2017. As helpful as it is to understand how businesses use chatbots, it’s even more important to know exactly why they’re migrating to these automation-fueled innovations in the first place. When combined with AI’s advanced evolution, the proliferation of modern messaging apps has already provided more than enough material to fuel the chatbot development flame—and add urgency to enterprise deployment efforts, too. As professionals, we’re all living through a unique (and important) stage in human history. Right now, natural human speech and chatbots sound almost indistinguishable from one another. For many organizations, that means a first chance to reach global consumers in an effective, cost-efficient way. And new third-party products, distribution channels, and specialized enablement strategies seem to pop up every day—enhancing these chatbot-driven efforts even further. In addition to upgrading outdated technologies, organizations are taking advantage of another interesting trend: compared to human employees, multiple studies have confirmed that people are more likely to let their guard down and open up to a computer about their problems. More and more organizations are discovering how helpful an AI-powered listener that doesn’t judge, stigmatize, or violate employee privacy can truly be. Simply put, chatbots make corporate interactions more personal and enjoyable. In fact, more than 50% of people prefer shopping somewhere that offers interactive chatbots—63% believe using one also generates positive feelings toward a particular business or brand. Companies are also using chatbots as a tool to lure millennial awareness and attention because they naturally align with this generation’s interaction style. Things like instant communication, the opportunity to engage with new technology, and a conversational tone go a long way in making a message resonate with this audience—and 80% of this group has either already used a chatbot or are interested in trying one out. So, who’s ready to start planning and preparing their enterprise chatbot deployment? Despite all this talk of AI and advanced technology, most people forget one simple fact: chatbots aren’t being implemented to improve customer issue resolution. Unfortunately, this technology isn’t ready to enhance traditional calls or emails in any substantial way yet. So, organizations need to be selective and think about how these innovations can best be used instead. For many, chatbots seem to be at their peak performance when used as a first responder tool in any customer interaction. Through real-time conversations and handing off untimely and/or unusually difficult problems to human support agents, chatbots can accelerate communication cycles and make customers happier. Most people are creatures of habit—we can’t help it. So, encouraging a new behavior like switching from traditional support avenues to chatbots can be tough to say the least. A major change like this requires exceptional experiences with the new technology, not to mention a hefty investment of time and money, too. However, the timing for one of these deployments has never been better. Today, 67% of consumers expect to message businesses even more than they already do in the future—and 56% prefer an interactive chatbot conversation over being stuck on a customer service hotline anyway. Chatbots prevent customer interactions from falling through the cracks, so an ideal deployment should keep aim to keep customers informed and connected with a certain company or brand. Unlike the customer service calls of years past, chatbots are equipped with software tools that enable a more intelligent, efficient issue resolution process. 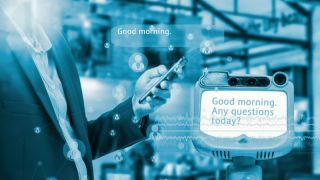 Over the next few years, it will be interesting to see how enterprise mobility adapts and evolves to include chatbots. The more important question, however, is exactly how does your enterprise plan to incorporate these AI-fueled innovations moving forward?